I've been trying to think of some regular features for my blog and I was "inspired" by some pinterest ideas I've run across so I thought "PINSPIRED" might be a nice tagline. A couple of weeks ago I had at least a half dozen friends pin the same cookie recipe for Salted Caramel Chocolate Chip Cookies. Salted caramel is all the rage and I needed to bring something to a superbowl party so I thought I'd give it a shot. ...is about all I can say about them. Rave reviews! 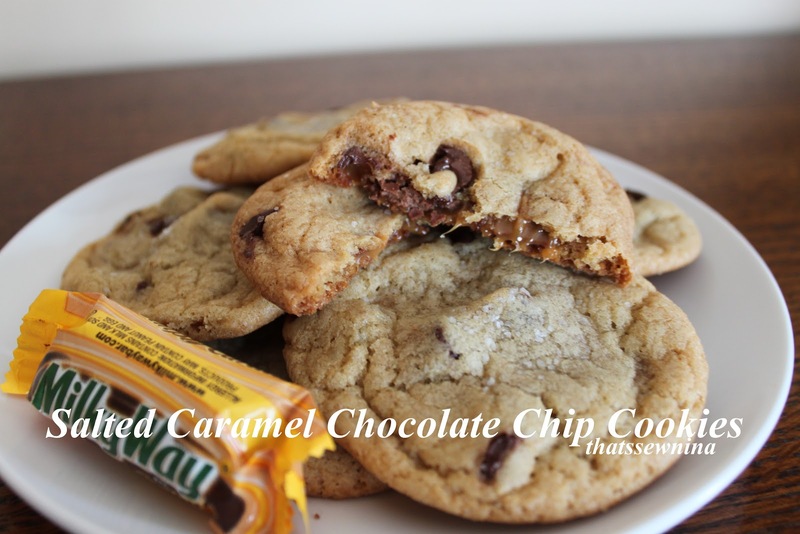 Mix a batch of your favorite chocolate chip cookie recipe. Cut a fun-size Milky Way Simply Caramel in half. Dip the open end in sea salt (secret? I just used regular table salt). Cover the candy with your cookie dough and form into a ball. Sprinkle the top with a little more salt (I used kosher salt on top). A few tips: I went according to the recipe but the recipe dough is a little buttery for me so the cookies were more flat and crunchy than mine usually are. Next time I think I’ll try my own favorite cookie batter and see how it goes. Just a preference thing. Trust me...there were no complaints about the awesome result of the original recipe. Also, I wasn’t sure how much cookie dough I should use with the candy so my first batch I used too much. My cookies were flat and the caramel was a little lost. I would recommend using as little cookie dough as you can to just cover the candy—about golf ball size in all. Try it out! I promise you won’t be disappointed. Sift or whisk together the flour with your salt and baking soda, set aside. Cream together the melted butter, brown and granulated sugar. Once incorporated, beat in the eggs, then vanilla. After the wet ingredients are combined, add in your dry ingredients. Mix until just combined and then add the chocolate chips, gently stir them in. Cut the Milky Way candies in half, dip them into sea salt to seal the open caramel end. Take a ball of dough, just big enough to cover the half-bar, add more dough if needed. Roll into a ball and sprinkle the top with more sea salt. Bake at 325 degrees for 17 minutes with 12 cookies per sheet. Let cool before transferring to a cooling rack. They don't taste weirdly salty on one end from dipping the candy bar? Hmm.. Might have to try this one! I was worried about the same thing! It seemed like a lot of salt for one cookie but it all melts together and the flavors balance out. Definitely give it a try.